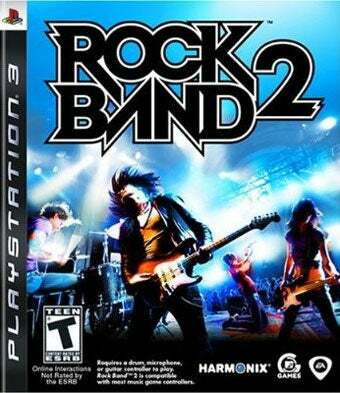 Owners of the PlayStation 3 version of Rock Band 2 will be asked to upgrade their copies to version 1.01 today. That hundredth increase in version numbering brings with it a bunch of new bug fixes, the most noteworthy being a corrected "interoperability issue" with Guitar Hero World Tour drum and guitar peripherals. Happy, happy clutter-free days! Even better, if you found yourself somehow on the receiving end of a copy of Konami's Rock Revolution, that game's drum kit will work too. For the full list of changes, read on. Release Notes: Hardware · Provided support for third party drum and guitar controllers including GHWT & RR. · Adjusted crosstalk values for drum hardware. · Bug fix for remote drum fills being silent – users will now hear the drum track when drum fills. Gameplay · Fixed overlapping drum fill bug on drum track. · Fixed rare network crash involving client signing out during setlist creation. · Fixed rare crash on calibration screen when users mash guitar controller buttons. · Fixed bug where Leaderboard scores in BWT were not uploading after users played the first song. · Fixed bug where Leaderboard career scores were posted including DLC songs and not just disc songs as originally intended.